All too often you don’t notice a problem with your website until either a customer calls you and complains, or you notice that your bank balance is a little lighter than expected at the end of the month. It can be weeks, or months sometimes before you realise this issue, and all too often it could be something that is easily fixed. 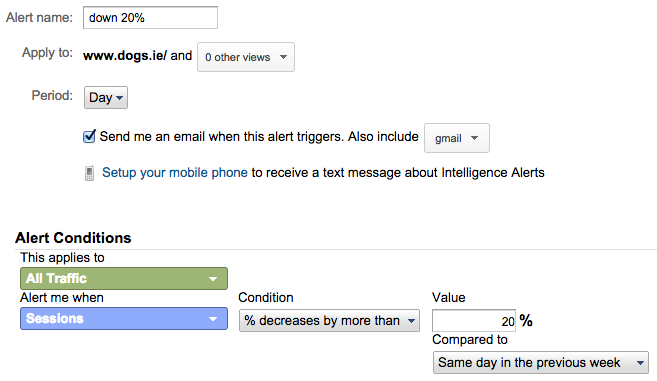 We use Google Analytics custom alerts to send us an email when the website traffic changes significantly. Another thing to also observe is if you suddenly get a traffic spike. Maybe you’ve done something particularly well with respect to SEO or you have gotten a new bit of coverage that’s sending you lots of traffic. Tweaking your website to take advantage of these traffic spikes can help you capitalise on this new found traffic better. It may be as simple as adding a graphic or text along the lines of ‘if you’ve come looking for product X that was featured on TV, click here to view it’. Small changes like this can dramatically improve your conversion rate. Here’s a trick I’ve been using for a few years, which has alerted me to both positive and negative traffic changes faster than I would have realised. Here I have set up an alert for a website of mine, dogs.ie, that will email me if the traffic on a particular day decreases by 20% or more. 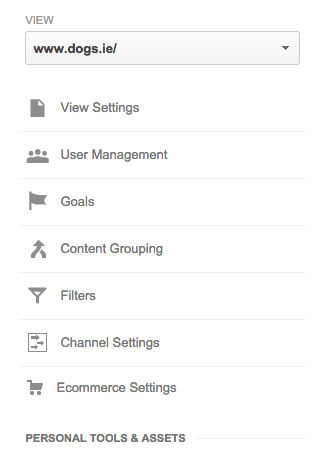 I also have ones for Goal conversions, but users sessions is about the easiest metric to initially monitor. I select that I want to compare it to the same day from the previous week. This is important in the case that you have significantly different traffic levels during the week compared with the weekend. 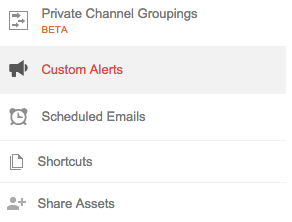 You can also consider adding weekly or monthly alerts also, but if you do I would also keep the daily monitoring active as well. And as a bonus I also have created an alert if the traffic grows more than 20% in one day too. You can of course change these numbers, personally I would keep them between the 10%-30% range, but it’s best to test this out for yourself.